There are many products that can be used to exfoliate skin flake build-up, from scrubs - to scrub sponges. Exfoliation of dry, dead cells on the surface help reveal new fresh skin, giving it a youthful glow. For sensitive skin, try an organic moisturizing exfoliating facial scrub, or a 100% natural chemical-free cotton washcloth. Another type of skin exfoliation is chemical exfoliation through products such as alpha-hydroxy-acids and salicylic acid. Most types of chemical exfoliation should be done very seldom, if at all. They can lead to skin irritation as well as over-sensitivity to sunlight. There are many lotion-based scrub creams also available for the face. One of my favorites is Clinique's 7-Day Scrub Cream, Rinse-Off Formula. This fine-grain exfoliator rinses off clean. It 'deflakes', clears pores, and refines the skin. It also helps to minimize the appearance of fine lines. Exfoliation can also be achieved by many other means - even something as simple, and gentle. 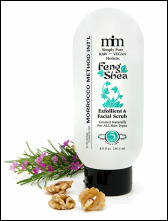 as a soft terry wash-cloth for the face. Another excellent exfoliator for the skins is the Flower Valley Ayate Washcloth. Made of 100% Natural Agave Fiber. Soft, 'scrubby', and long-lasting. If you prefer a sponge for skin exfoliation, Buf-Puf makes a gentle but effective facial sponge in Regular, Gentle, and even extra-Gentle. Another wonderful way to 'polish' the skin to a beautiful glow, leaving it baby soft, is the Clarisonic Skin Cleansing Brush. At first, I had hesitated to buy this item, wondering if it really could 'be that good' - but it truly is. There has been no comparison (and no regret!). See more information on the Clarisonic's ability to exfoliate and clarify facial skin to beautiful perfection on the next page.